In last year's Fishing in the Air, Creech took a spare, metaphorical approach to a father-son relationship. 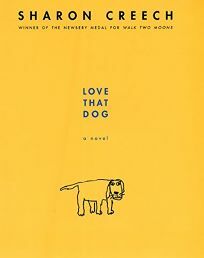 Here she examines the bond between a boy and his dog to create an ideal homage to the power of poetry and those who write it. The volume itself builds like a poem. Told exclusively through Jack's dated entries in a school journal, the book opens with his resistance to writing verse: "September 13/ I don't want to/ because boys/ don't write poetry./ Girls do." Readers sense the gentle persistence of Jack's teacher, Miss Stretchberry, behind the scenes, from the poems she reads in class and from her coaxing, to which the boy alludes, until he begins to write some poems of his own. One by William Carlos Williams, for instance, inspires Jack's words: "So much depends/ upon/ a blue car/ splattered with mud/ speeding down the road." A Robert Frost poem sends Jack into a tale (in verse) of how he found his dog, Sky. At first, his poems appear to be discrete works. But when a poem by Walter Dean Myers ("Love That Boy" from Brown Angels) unleashes the joy Jack felt with his pet, he becomes even more honest in his poetry. Jack's next work is cathartic: all of his previous verses seemed to be leading up to this pièce de résistance, an admission of his profound grief over Sky's death. He then can move on from his grief to write a poem ("inspired by Walter Dean Myers") about his joy at having known and loved his dog.